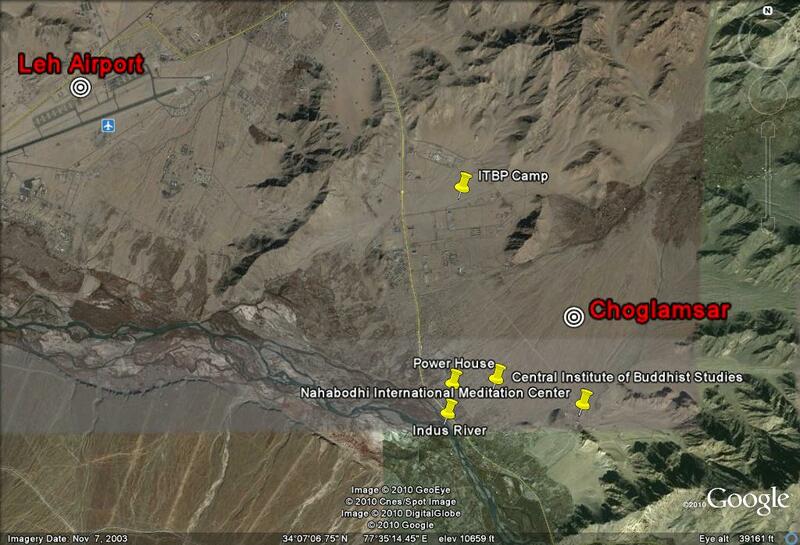 Choglamsar is a refugee colony on the outskirts of Leh in ladakh, India. This place is situated at about 9 Km from Leh on the road to Hemis, where one of the richest monastery of Ladakh is located. When this area was earmarked by the Government for the settlement of Tibetan refugees, it was a barren land on the banks of Sindhu or Indus river, full of rocks, stones and sand. Neither there was any electricity supply, nor any drinking water available. Even the approach roads were not here. The refugees, with their hard work have converted these barren lands into a heaven on earth. This place has become now a show piece for the culture and history of Tibet. The settlement is now economically independent with various small scale industries like carpet weaving, generating income for the inhabitants. There is a special settlement for only refugee children here. 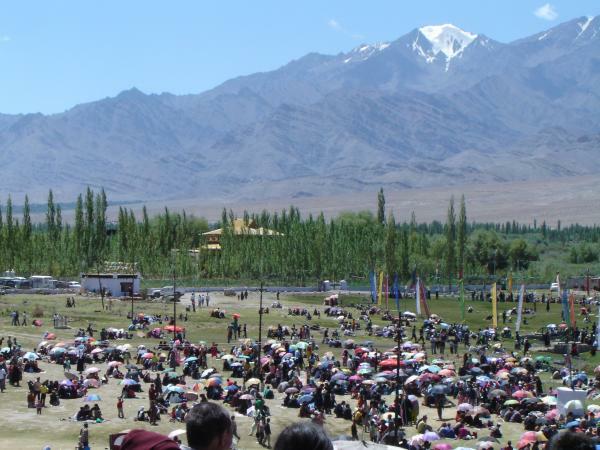 A center giving information about Tibet's history and culture has been set up here. Another institute known as Central Institute of Buddhist Studies is also located nearby. The settlement has it's own electrical generator which supplies electricity to the settlement. In 2007, Revered Tibetan leader Dalai Lama had visited this settlement and had given his blessings to the refugees. On this occasion, very large number of Buddhists had gathered here to listen to him. Heavens crashed on this beautiful Choglamsar, about two years ago or on the night of 6th August 2010. A cloud burst over this place and within one hour, 250 mm or 10 inches of rain fell over this place. In Ladakh, it never rains like this. At the most you may have a brisk light shower. Because of the scanty rains, the houses here are built from unbaked clay bricks and are also built using clay. These houses just dissolved in the horrific downpour. Hundreds of people lost their lives in the flash floods. For Hundreds of people, their whereabouts are still unknown. This town in located on the main Leh – Manali highway. This highway also was washed away. There was a great loss because of the destruction of various buildings and houses. Official reason that has been given for this calamity is a cloudburst. What actually is a cloudburst? I was curious to find out and carried out some research on the net. According to the Meteorological department of India, there is no such natural event or happening that could be called as a cloudburst. Whenever, at any place, more than I inch of rainfall occurs in a short span of time, this rainfall is termed as cloudburst. This means that Cloudburst is just a name given for very heavy rainfall. Such heavy rain is not caused by bursting off any clouds as such. A book of records for such excessive rainfalls termed as cloudbursts, all over the world, is available on the net. The record entries for top cloudbursts worldwide, are like this. Barot, Guadeloupe, 26 November 1970, 1.5 inches in 1 minute. Port Bells, Panama, 29 November 1911, 2.43 inches in 5 minuts. Plumb Point, Jamaica, 12 May 1916, 7.8 inches in 15 minutes. Curtea-de-Arges, Rumania, 7 July 1947, 8.1 inches in 20 minutes. Guinea, Virginia, USA, 24 August 1906, 9.25 inches in 40 minutes. The cloudburst at Choglamsar, Ladakh, definitely can be included in this list of records without least doubt. Why such excessive rain or Cloudburst does happen? We all have seen the purple black thunderclouds that bring, high winds, thunder and heavy showers. These clouds are technically known as ' cumulonimbus clouds'. Such kind of clouds and hot weather with high moisture content is necessary to bring about a possible cloudburst. Under such conditions, unusually large sized raindrops can get formed. cumulonimbus clouds have another special property. Below these clouds, fast moving air updrafts are normally formed. Because of these rapidly moving air currents or updrafts, many vacuum pockets are formed in between these updrafts. The large sized raindrops remain floating in air because of these updrafts and are wildly thrown around. If these raindrops hit other raindrops in this wild movement, even bigger sized raindrops are formed. 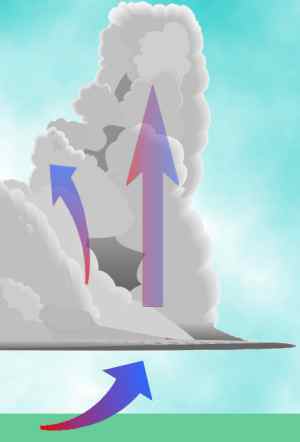 After a while, updraft air currents become weaker and can not support the raindrops. In such conditions these large sized raindrops crash on the earth below with a great velocity exceeding 25 to 50 miles per hour. From ground level, this entire process appears like a paper bag full of water, getting wet and then bursting out to release all water. It appears that the water is just being poured out from a split cloud and that is why the name cloudburst! This pouring rainwater from skies above, hammers and batters the land along with bushes and trees. The ground is unable to absorb this quantity of water in such short time and localized very heavy currents of water or flash floods start flowing. These flash floods can easily destroy trees, crops, small animals and later can cause heavy floods in nearby rivers. Ladakh is the largest district of India having 95000 square Km area. Many ask that in such a huge land area, why Choglasmar was selected for this cloudburst by nature? If we see the geography of this place we can see a large green belt that has been created here by the agricultural fields. Choglamsar is located approximately at the middle of this green belt. Because of this green belt, the moisture content in the weather above has gone up lately. Beside this, the vicinity of the Indus river basin nearby, and daytime hot temperature, helps the natural cloud formation process here. 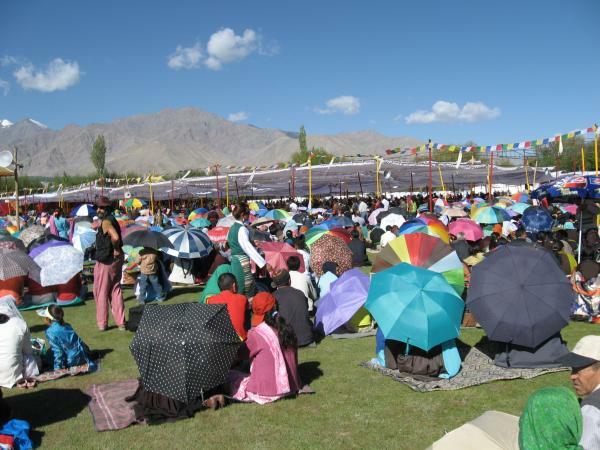 Since 1992-93 some rainfall occurs in Ladakh every summer. This desert rain has created a strange paradox for the environmentalists. The houses, monasteries in Ladakh were never built considering their endurance during rainy weather and are unlikely to survive in the changing weather pattern. Only a fool would think that no agricultural production should be taken here because it induces rainfall. What needs to be done on war footing, is to change or adopt the building construction techniques appropriately. As long as this does not happen, chances of more Choglamsar cloudburst tragedies happening in entire Indus river basin, can never be avoided completely.